The so-called ‘Command Post’ today instructed the country’s security forces to “take all the necessary measures,” that normally include but not limited to killing, jailing and terrorizing anyone demanding political reforms in the restive Oromia region. The increasingly paranoid Ethiopian regime today ordered the country’s security forces to “take all the necessary measures” to deal with anti-government civilian protesters demanding political reforms in the restive Oromia region. A statement issued today by the so-called ‘Command Post’, the military and security committee administering a state of emergency declared in the country last week, instructed the military to deal with “illegal forces” in Oromia if they “do not refrain” from their destructive actions immediately. The statement that was broadcasted via the ruling-party funded Fana Broadcasting Corporation specifically mentioned the renewed protest in the country’s Oromo region, where opposition leaders were banned from meeting their supporters last week, triggering new wave of protest in Nekemte and Dambi Dolo towns. 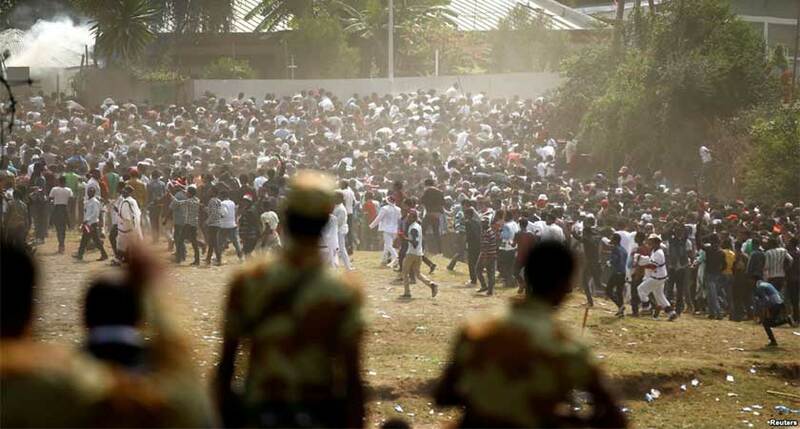 Two people were killed so far and seven other wounded as protests continue in Nekemte and Dambi Dolo, Oromia spokesman Addisu Arega said in a Facebook post Tuesday, citing reports received by the regional government. The government has been struggling for more than two years to end sporadic and often deadly anti-government protests in the Oromia and Amhara regions. The Oromo and Amhara communities together make up more than half of Ethiopia’s population, Africa’s largest after Nigeria. Activists from both groups claim that minority ethnic Tigrayans, who are about 6 percent of the population, dominate an authoritarian government. Hundreds of people were killed, about 2000 by some estimates, in the East African Country since. Tens of thousands of people have been thrown in jail. Some prominent political prisoners have been released a few weeks ago in response to pressure from protesters but many more are still behind bars.